What could be better than a grilled cheese? 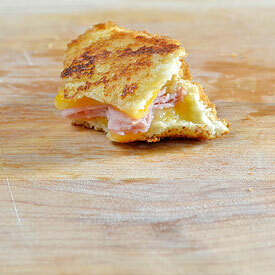 A grilled HAM and cheese! 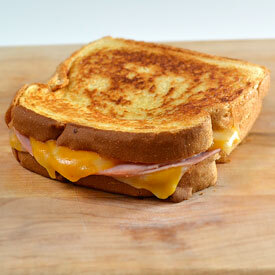 When I was in high school I worked near a small diner and I loved their grilled ham and cheese. I would have ordered them all the time if they served three per order. I could destroy one in about 20 seconds and I was always left wanting more. I would get them as a snack and they were one of my favorite items on the menu. When I make them at home I usually make at least two. The first goes down in record time and then I can savor and enjoy the second. I don’t know what it is, but I just seem to devour these little guys like a hyena devouring a wildebeest on the Serenghetti plain. Instead of going with American cheese I decided to get creative and I went with colby-jack, which added an extra flavor element to the final product and really just inspired me to eat the first one even quicker. 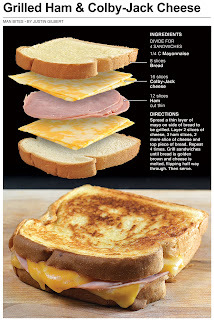 Also, I use thin slices of ham, which is key - a slice too thick gets in the way of the creamy cheese. Maybe I should experiment with bigger slices of ham just to make them last longer than 30 seconds. The first sami didn't last long enough for a photo. Over the weekend the family was out at the campground for a Saturday afternoon dinner. I decided to make a variety of grilled cheese sandwiches to contribute. I have a new camp chef stove with a griddle attachment and I was itching to put it to use. Needless to say the grilled cheese went over like new toys on Christmas morning. Each one I made I cut into quarters turning them into finger food. The kids inhaled them and most of the adults grabbed a couple for a snack. I made some with cheddar cheese and some with a new cheese, chipotle pepper jack that was really tasty. I think the campground grilled cheese might become a tradition. After dinner was over, the golden brown crust I had on the sandwiches became a topic of discussion. Most thought I had used butter and were surprised to learn I had used mayo. It’s the only way to toast your bread! Spread a thin layer of mayo on side of bread to be grilled. Layer 2 slices of cheese, 3 ham slices, 2 more slice of cheese and top piece of bread. Repeat 4 times. 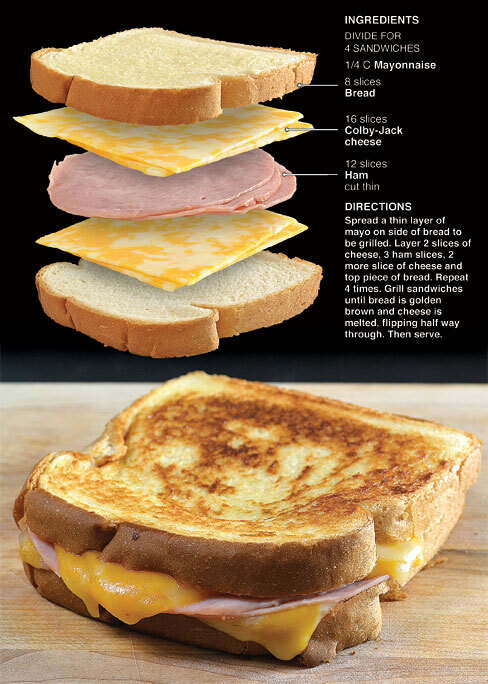 Grill sandwiches until bread is golden brown and cheese is melted, flipping half way through. Then serve.